Sky Blue Outfitters has been in business since 1999 when Rick started guiding in Pennsylvania. Because of his travel to the Adirondack Park in New York. 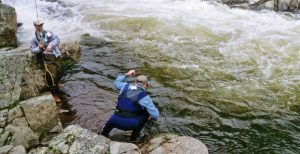 Rick decided to get his NY license in 2002 and formed Sky Blue Outfitters to start running packaged trips to the West Branch of the Ausable River. Over the years Sky Blue has grown into one of the most comprehensive guide service in Pennsylvania offering day trips, drift boat trips and overnight destination trips. The guide team has well over 75 years of guiding experience all around Pennsylvania and outside the state for Trout, Pike, Muskie, Bass, Redfish, Seatrout and Mahi-Mahi. Each staff member has different skill sets to provide the client with education, fishing techniques and most important, how to catch more fish. Sky Blue is ready for the next 20 years. Brian Shumaker, Rick Nyles, Dave Allbaugh, Taylor Helbig and Dave Rothrock have accumulated many awards and have contributed to many fly fishing events, publications/print media and digital media around the country.